El Dorado Hop Pellets - 1 oz. Released in 2010, this dual-purpose hop named after the lost city of gold, went through a period where it wasn't available to the homebrew community, but now it is! El Dorado elicits responses of fruity notes, specifically tropical fruit flavors. Other fruit notes offered have been pear, watermelon candy and stone fruit. 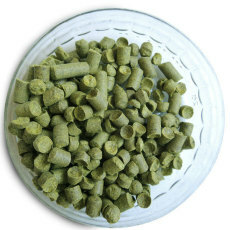 Mosaic Hop Pellets - 1 oz. Mosaic is a great dual purpose hop that is the daughter of Simcoe. As its name implies, this hop comes with a variety of aromas and flavors including tropical fruit, citrus, berry, herbal, and earthy-piney aromas. Its the star of the show in our popular Mosaic Medley beer kit! Falconer's Flight Hop Pellets - 1 oz. A Pacific Northwest hop blend that is an excellent complement to many IPA and Pale Ale oriented hop varieties. Tropical, floral, lemon, and grapefruit characteristics. Sterling Hop Pellets - 1 oz. An aroma hop that is a great substitute for Saaz. Herbal and spicy, with a hint of floral, citrus (lemon/pineapple) characteristics. Styrian Goldings (Celeia) Hop Pellets - 1 oz. A Slovenian grown Fuggle with a delicate and spicy aroma. Use this hop if your recipe calls for Styrian Celeia because they are virtually the same. Spalt Hop Pellets - 1 oz. A German noble hop with the traditional spicy aroma. Spicy with notes of cinnamon, floral and fruit. Saaz Hop Pellets (Czech) - 1 oz. Perle Hop Pellets - 1 oz. Indicated for aroma but we like it more as a bittering hop. Palisade Hop Pellets - 1 oz. Palisade features floral, fruity and earthy aromas . Nugget Hop Pellets - 1 oz. A high alpha hop that is also used as a flavor and aroma hop. Herbal, spicy, and somewhat citrus tones. Northern Brewer Hop Pellets - 1 oz. This earthy variety is the signature hop in Anchor Steam.